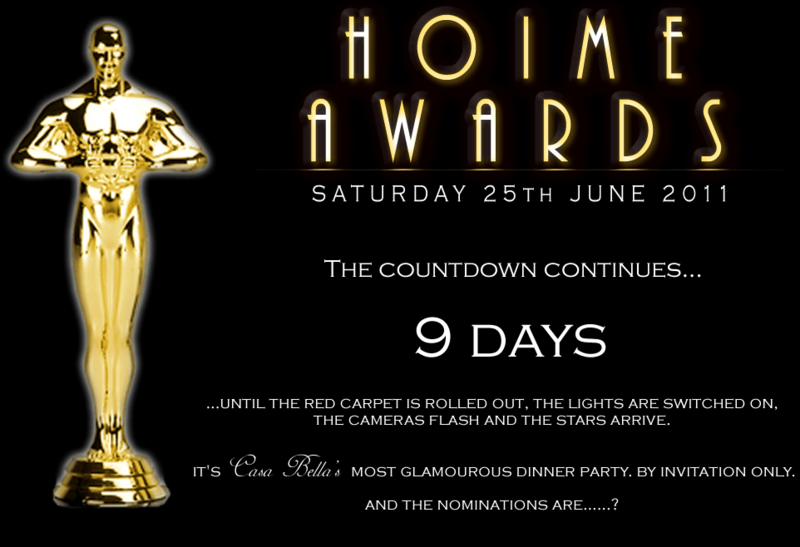 Less than 9 days until Casa Bella’s HOIME awards. The heat is on! Ready or not, the countdown to Casa Bella’s 2011 HOIME Awards continues and if I still had my lovely locks of black hair, I’d surely be starting the plucking process by now! Okay maybe not but Casa Bella’s HOIME Awards ‘a la Oscars’ has got to be right up there with one of the most glamorous, if not ambitious, dinner parties we’ve ever held, at least logistically! This is because, for us, the whole point of hosting these dinner parties is for the experience that we can offer our guests. There’s much to be said about eliciting that all important “wow”. But that means things happening, people being in the right place, drinks and dinner served at the right time. So what if things don’t go to plan? Well, apart from a lot of swearing, that’s generally what contingencies are for. I’ve been asked what exactly is going through my mind at time like this? Um, “did I put that on that list?” generally and, “oh S#@t! haven’t I ordered that yet? Meanwhile, Francesca is thinking, “oh great, I’m really looking forward to another week with my stress pants-turrets stricken brother”. Jokes aside (well, not exactly a joke), there simply is a lot of pressure for these events to go well and for them not to look excessively micro managed. Striking a balance is all important both for our sanity and for that of our guests. Ultimately, we want them to have a great time and we want to share that good time also. And if things don’t quite go to plan then even a control freak like me has to learn to roll with it. I’ll then be turning my attention to front of house. Generally, 24/48 hours before curtain up, I’ll start the laborious yet perversely pleasurable task of setting the table. What?! 24 hours to set a table? Well, not exactly 24 hours but the process generally takes that long. One main reason is to ensure that everything is just so and if there are any last minute dramas they can be easily dealt with without too much stress (like missing cutlery, you know, the usual stuff). <sigh> and then, before we know it, it’ll be curtain up. The adrenaline will be pumping and the nerves a jumping but we’ll be excited… it’s the moment we’ve been waiting for; months of planning, days of preparing but we’ll get to spend several special hours in the company of very dear friends and, hopefully, the opportunity to give them a unique experience that they can cherish for many years to come.